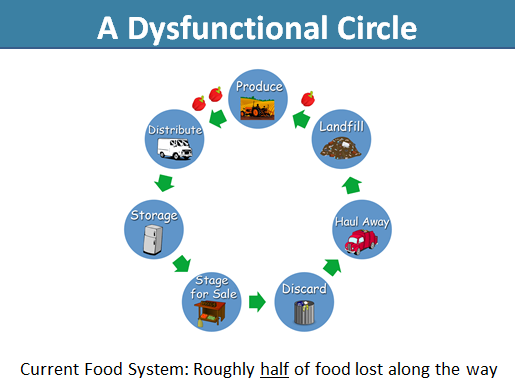 The Food System: A Dysfunctional Circle…. One of the problems with our current food system is the “quest for perfection” on the part of consumers and retailers – which ties to our culture of abundance. Consumers expect perfect produce at all times – and they expect fully stocked shelves at all hours of the day and night. There is a hidden cost to those expectations in the form of food waste – far too much food ends up in the dumpsters behind the stores – and eventually in the landfill – as much of that food goes beyond its prime. Consumers see little of this; if they did – it would likely help to change their behavior – and they would in fact demand change from their retailers. We would all benefit from being open to fresh produce which is not perfectly uniform, and shelves that are not fully stocked at 1 AM. The result would be far less waste of food – and the resources that went into producing that food. At present our food system resembles a dysfunctional circle – we produce vast quantities of food, distribute it, store it, and stage it for sale – only to haul away about half of it later when it surpasses its prime (and utilize even more resources in the process). Thinking about this individually, how many of us would work 8 hours a day to produce 10 items knowing that at the end of the day we would throw away 5, incur additional costs for disposal, harm the environment in the process, and divert resources from where they could be effectively used elsewhere? Urgent change is needed in this system, and it starts with awareness and educated consumers who can drive change among retailers to improve the circle of dysfunction.